A site visit with John and Joe this week confirmed the fluffy masses were Woolly Alder Aphids (Prociphilus (= Paraprociphilus) tessellatus). The nymphs exude white waxy filaments from block-like structures on their backs (tessellatus means "mosaic pattern"). Woolly alder aphids share a number of traits with Beech Blight Aphids (Grylloprociphilus imbricator); the so-called "boogie-woogie aphids" that have danced their way through the BYGL on numerous occasions [see the July 20, 2017 BYGL, "Return Engagement of Boogie-Woogie Aphids"]. Both form large, white fluffy colonies on tree branches owing to individuals becoming covered in strands of white filaments. Both are primarily nuisance pests with limited impacts on the overall health of their tree hosts; controls are not warranted. And, both do the woolly two-step when disturbed by pulsing their posterior ends in unison. Of course, cold temperatures put the kibosh on any dancing by the woolly alder aphids; they were alive but barely moving. However, beech blight aphids don't remain on branches through the winter; they pass the winter as eggs protected from the elements in bark crevices. Many aphids overwinter in the egg stage. I couldn't imagine finding aphid colonies still surviving on exposed branches at this time of the year. That is, until I learned about this aphid's complicated life cycle involving two tree hosts: alder and silver maple (Acer saccharinum). Indeed, the alternate common name for this aphid is Maple Blight Aphid. This is a significant difference from beech blight aphids which are only found on one tree host, American beech (Fagus grandifolia). 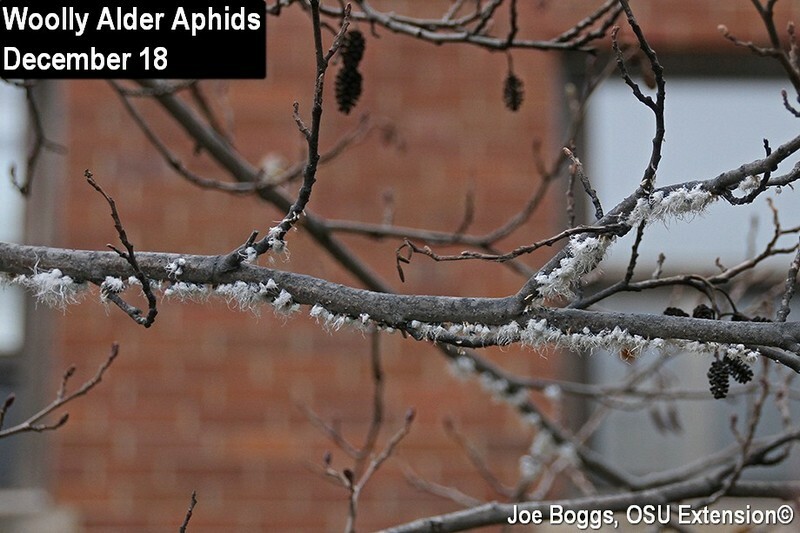 According to Johnson and Lyon (Insects that Feed on Trees and Shrubs, 2nd Edition), some of the woolly alder aphids found on alder branches remain clustered together in dense colonies during the winter which explains what we saw on the UC Campus. However, some of the nymphs will mature into adults with wings in the fall prior to winter and these will split from alder colonies and fly to silver maples. These winged aphids are both males and females. Once mated, each female lays a single egg in a bark crevice. That's how and where these "maple aphids" spend the winter. The eggs on maple hatch in the spring, around bud break, and the immature aphids (nymphs) migrate to newly expanding leaves where they line-up on midveins and use their piercing-sucking mouthparts to tap into phloem vessels. These aphids are all females and they reproduce asexually to form large, fluffy colonies. Heavy infestations can cause noticeable leaf curling. The phloem-sucking aphids also produce copious quantities of honeydew that rains down on leaves, branches, etc. to become colonized by black sooty molds. By mid-summer, the colonies of "maple blight aphids" produce adults with wings but their ultimate landing target are alders. These relatively large aphids are covered in waxy filaments and look like flying puffballs. They are not particularly good flyers and large numbers can make them a serious nuisance pest as they drift around landscapes with heavily infested maples. Indeed, I visited a landscape in southwest Ohio in late June with several heavily infested silver maples. Most of the winged migration from the maples had already occurred. However, the homeowners told me they felt under siege during peak flight with flying puffballs wafting all around their landscape making it impossible for them to use their patio or remain outdoors for any length of time. They noted the activity continued for about a week. Once these winged woolly aphids settle onto alder branches, they begin reproducing asexually to create colonies that expand with each succeeding generation. However, winged aphids do not reappear in the colonies until the fall when a subgroup of new adults with wings split to seek out silver maples. Recapping significant points of this aphid's two-host life cycle, it's important to remember that this aphid can overwinter and remain on alders year after year; they don't require silver maples to complete their life cycle. However, they do not remain on silver maples past mid-summer. This "disappearing act" can be very dramatic with high populations seeming to suddenly disappear as the fluffy winged adults leave the maples to seek alders. The BYGL was nestled all snug in its bed while visions of bagworms danced in our heads. Out on the lawn, no clatter's awaiting; except for the hiss of St. Nicholas deflating. An e-mail arrived with an audible ding; a picture attached of an unusual thing. White on alder looked like new fallen snow, but no dusting of flakes were on objects below; when, what to my wondering eyes should appear, but clusters of aphids with white derrieres.